Today I want to write about leatherback turtles because they have a very unique shell. These massive turtles are the largest of all turtles, growing well over 2 metres long and weighing over 700 kg. Their huge flippers grow to over 2 metres as well. The largest ever leatherback turtle was 3 metres long and weighed 916 kg. They get their name as they don’t have a bony shell like other turtles, but have very leathery skin with 7 ridges along the back. Their diet exists almost entirely of jellyfish. They often eat plastic bags by accident as they look like their prey, which is why it’s important to put rubbish in the bin. At breeding time, females come to shore and dig a hole in the sand before laying about 110 eggs. They then cover the eggs in sand before leaving. As with many reptiles, the temperature influences whether the babies are males or females. Once the male babies enter the water, they never go on land again during their lives, whilst the females will often return to the same beach to nest. They are found in the open oceans of the world and have a way of regulating their own temperature that enables them to survive in much colder waters than other sea turtles. They are considered vulnerable to extinction due to climate change issues, egg harvesting, accidental capture in fishing nets and eating plastic bags. 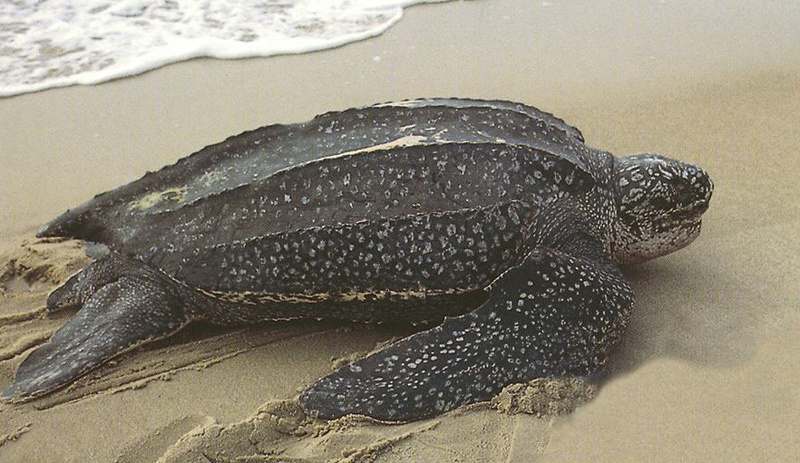 Are there any other interesting facts that you would like to share about leatherback turtles? That is cool. I’ve been doing research on sea turtles so this helps!